PRELIMINARY INFORMATION: NO PURCHASE NECESSARY. A PURCHASE WILL NOT IMPROVE YOUR CHANCES OF WINNING. Void outside the WNBC Terrestrial Geographic Viewing Area (defined below) and where prohibited. 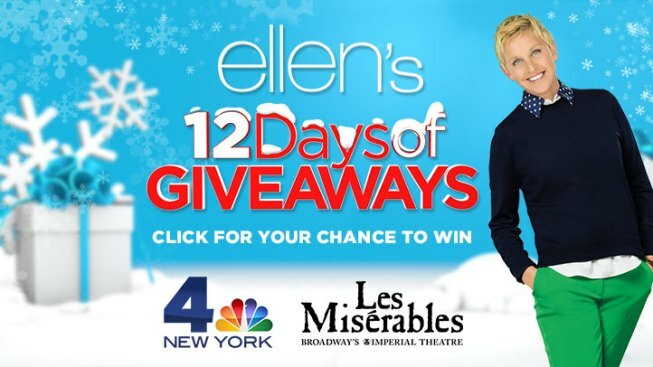 The WNBC Ellen 12 Days Sweepstakes (“Sweepstakes”) will begin on November 23, 2015 at 8:00 A.M. ET and end on December 10, 2015 at 11:59 P.M. ET (“Sweepstakes Period”). All times in the Sweepstakes refer to Eastern Time (“ET”). Odds of winning depend upon the number of eligible Entries (defined below) received. Sweepstakes is subject to all applicable federal, state, and local laws. PRIZES (DEFINED BELOW) DO NOT INCLUDE TRANSPORTATION, PARKING, OR ACCOMODATIONS. All taxes and other expenses, costs, or fees associated with the acceptance and/or use of the Prize are the sole responsibility of the Winner. TO ENTER: To enter the Sweepstakes, during the Sweepstakes Period visit the WNBC Facebook page located at http://www.facebook.com/NBCNewYork (“Website”) and access the “Ellen 12 Days Giveaway” tab (“Sweepstakes Tab”). Then, follow the provided instructions to complete and thereafter submit the entry form, which includes your email address, followed by your name, telephone number, and city of residence (“Entry”). All Entries become the property of Sponsors and will not be acknowledged or returned. Entries must be received before December 10, 2015 at 11:59 P.M. ET to be eligible for the Sweepstakes. Sponsors’ computer shall be the official timekeeper for all matters related to this Sweepstakes. You may submit one (1) Entry per day during the Sweepstakes Period, and up to two (2) Bonus Entries for a total of twenty (20) entries. Multiple Entries received from any person or email address beyond this limit will void all such additional Entries. Entries generated by a script, macro, or other automated means or by any means that subverts the entry process will be disqualified. Entries that are incomplete, garbled, corrupted, or unintelligible for any reason, including, but not limited to, computer or network malfunction or congestion, are void and will not be accepted. In case of a dispute over the identity of an entrant who made a potentially winning Entry, Sponsors reserve the right to deem that the Entry was made by the registered subscriber of the email address submitted at the time of Entry. Entry constitutes permission (except where prohibited by law) to use entrant’s name, city, state, likeness, image, and/or voice for purposes of advertising, promotion, and publicity in any and all media now or hereafter known, throughout the world in perpetuity, without additional compensation, notification, permission, or approval. WINNER SELECTION AND NOTIFICATION: On or about December 11, 2015, one (1) potential winner (“Winner”) will be selected in a random drawing by representatives of Sponsors from all eligible Entries received during the Sweepstakes Period. Sponsors will announce the names of potential Winner on Website on or about December 16, 2015. Sponsors will make two (2) attempts to notify potential Winner at the phone number and/or email address submitted at the time of entry. Potential Winner may be required to execute and return an affidavit of eligibility, release of liability, and, except where prohibited, publicity release (collectively, “Sweepstakes Documents”) within two (2) days of such notification. Noncompliance within this time period will result in disqualification, and, at Sponsor’s sole discretion an alternate potential Winner may be selected from the remaining eligible Entries. If a potential Winner cannot be reached, if he/she is found to be ineligible, if he/she cannot or does not comply with these Official Rules, or if his/her Prize (defined below) or Prize notification is returned as undeliverable, potential Winner will be disqualified and time permitting, at Sponsor’s sole discretion, an alternate potential Winner may be selected from the remaining eligible Entries. PRIZE: There will be one (1) prize package awarded (“Prize”) to the Winner. Each Prize consists of the same and/or comparable prizes, as determined in Sponsor’s sole discretion, given to The Ellen DeGeneres Show’s live studio audience from the 12 Days of Giveaways. Estimated Retail Value (“ERV”) of the Prize is thirty-thousand dollars ($30,000), but may vary significantly based on the 12 Days of Giveaways prize given out on the corresponding Ellen DeGeneres Show. Actual Retail Value (“ARV”) of Prize may vary. Any difference between stated ERV and ARV will not be awarded. Winner will receive an Internal Revenue Service Form 1099 from Sponsors for the total ARV of Prize for the calendar year in which Prize was awarded. Winner must claim Prize or Prize will be forfeited. All details of the Prize will be determined by Sponsors in their sole discretion. Sponsors reserve the right to substitute a similar Prize (or Prize element) of comparable or greater value. All taxes and other expenses, costs, or fees associated with the acceptance and/or use of the Prize are the sole responsibility of Winners. If Winner does not agree to accept all tax implications, Prize will be forfeited and an alternate Winner will be selected from the remaining eligible Entries at Sponsors’ sole discretion. Prize cannot be transferred by Winners or redeemed for cash and are valid only for the items detailed above, with no substitution of Prize by Winners. If the Prize is unclaimed within a reasonable time after notification from Sponsors, as determined by Sponsors in their sole discretion, it will be forfeited, and time permitting, an alternate Winner may be selected from the remaining eligible Entries at Sponsors’ sole discretion. Winner agrees to comply with all applicable regulations in connection with the Prize. Sponsors shall have no responsibility or liability for cancellations, delays, or any other change by any company or person providing any element of the Prize, and are not responsible or liable for any expenses incurred as a consequence thereof. RECORDING: Sponsors, in their sole discretion, may choose to record and/or broadcast the Appearance of the Winner. If Sponsors, in their sole discretion, elect to incorporate any audio and/or video recording of the Winner (the “Recording”) into television shows, the taping and/or the Recording will not be considered an employment opportunity, and Winner will not be entitled to compensation or credit thereof. Sponsors will determine the nature of the Recording in their sole discretion. If the Recording is broadcast, such broadcast will be at a time, for a length of time, and on a date determined by Sponsors in their sole discretion. Winner may be required to return completed and signed appearance releases, confidentiality agreements and such other documents as may be required by Sponsors. Failure of Winner to complete and execute these documents in a timely manner, as determined by Sponsors in their sole discretion, may cause the Winner to be disqualified and any potential Prize to be forfeited. The content of the Recording as, and if, finally exhibited and the number of exhibits and re-airs thereof, if any, will be determined by Sponsors in their sole discretion. Winner will not have a right of review, notice, or approval of the content of the Recording or any exhibition or exploitation thereof. Sponsors have the right, in their sole discretion, to disqualify Winner, cause the Prize to be forfeited, at any time, if any Winner behavior is deemed by Sponsors to be disruptive or if it may or does cause damage to person, property, or reputation of Sponsors or if it otherwise violates the policies of Sponsors, or if entrants do not follow the directions of Sponsors at all times. These Official Rules and the Sweepstakes itself are neither a contract nor an application for employment. WINNER ANNOUNCEMENT: For the names of Winners, available after December 16, 2015 send a self-addressed, stamped envelope to be received by January 16, 2016 to: WNBC Ellen 12 Days Giveaway Sweepstakes, 30 Rockefeller Plaza – 7th Floor East, New York, NY 10112 Attn: Mickey Adolph. Les Miserables On Broadway is not a Sponsor of the Sweepstakes and is not associated with the administration of the Sweepstakes in any way.